Condors are extremely social creatures which makes them so interesting to observe, as you Condor Watchers can relate! Conveniently for us in the field, condors are diurnal and most active during midday as winds and thermals create favorable conditions for extended soaring flights. In the early morning hours, condors can typically be observed leisurely preening and sunning from their roosts atop tall trees or cliffs. It is common to see condors roosting together, whether it is on the same branch, in the same tree, or in a neighboring tree. The old adage, “safety in numbers”, is certainly true when it comes to condors. At communal roost sites, you can often expect to see frenzied activity at sunset as the birds compete for the most favorable or highest roost. Usually, the older and more dominant condors win the most coveted perches and any condor forced to perch below them will wake up covered in excrement. Such is the life of a lowly juvenile! As the sun rises the next morning and weather heats up, condors will begin launching one after the other from their roost sites to forage, fly back to a known carcass, or travel back to a nesting territory. This leisurely behavior and social hierarchy often extends to communal feeding sites as well. 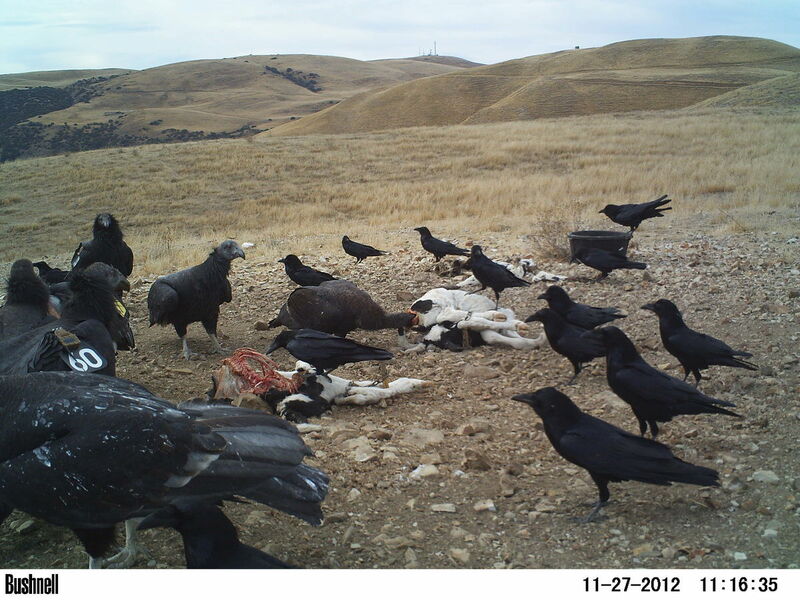 Younger condors are often forced to wait their turn at a carcass while older or more dominant birds get their fill. In this situation, juveniles can be observed laying down and socializing with each other by entwining necks, allo-preening, and wrestling. Some of us in southern California call this a condor huddle puddle :). Other times, condors will loaf around or preen on the ground after feeding as long as they don’t feel threatened. 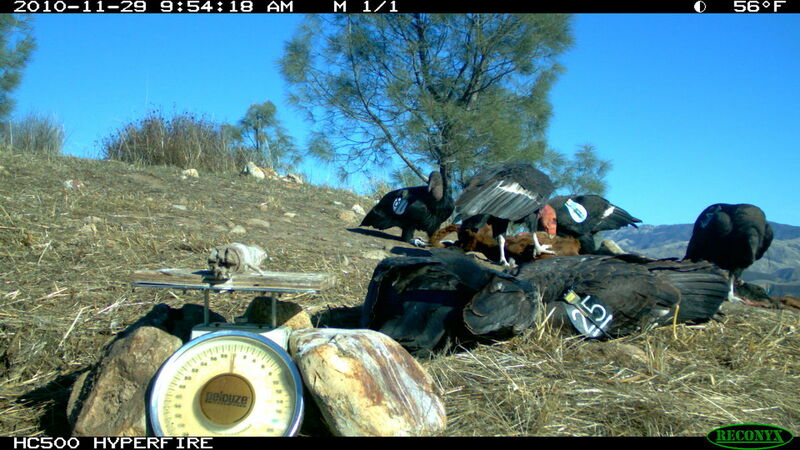 We often see this at baited trap sites, where the motion-activated cameras have been installed, because it is a common and familiar source of food. Socialization in the condor world is extremely important for individuals to practice and be fluent in “condor” language, body language or otherwise, so that they can operate and function in the community flock. Among other things, the motion-activated cameras provide us with snapshots of behavior and social interactions which help give us insight into the complex condor community. Devon Pryor was formerly a Biological Science Technician with the US Fish Wildlife Service, working on the condor program. She continues to work with condors in her current position as Conservation and Research Associate at the Santa Barbara Zoo.